Today, we take an in-depth look at the Real Madrid uniform for 2018 – the battle gear of one of world most elite football clubs in the world. For a number of years Los Blancos have been dominating football venues all over the world. After their grand achievement of “la decima” they battled to add two more Champions League trophies to the tally, back to back. Arguably the world’s most powerful side, they wage a dogged yearly war at home with two powerful clubs – Barcelona F.C and Atletico Madrid – a never ending contest of top skill. Their identity is forged through their colours which just like the supporters of the club travel with them everywhere. Let’s have a look at the kit of Madrid’s most celebrated side and closely examine their visual identity, shall we? The Real Madrid home jersey is the shirt of football legends like Alfredo Di Stéfano, Ruud van Nistelrooy, Ronaldo Luis Nazário de Lima, Luis Figo and Zinédine Zidane. It is now the veil of Gareth Bale, Sergio Ramos and of course Christiano Ronaldo. Due to its star studded past, it may just be one of the most iconic football jerseys in the world, alongside that of Manchester United, AC Milan, Liverpool F.C. and just a few others. And every football fan knows well that the shirt of Los Blancos – as the nickname would suggest – is white. It has always been white and that is not likely to change in the next century or two. Unless of course, the club makes an unexpected merger with its neighboring Atletico, in which case a change may occur. But I think we are all in agreement that this as likely to happen as a meteor striking the earth and causing an extinction of a dominant species. And what are the chances of that, right? 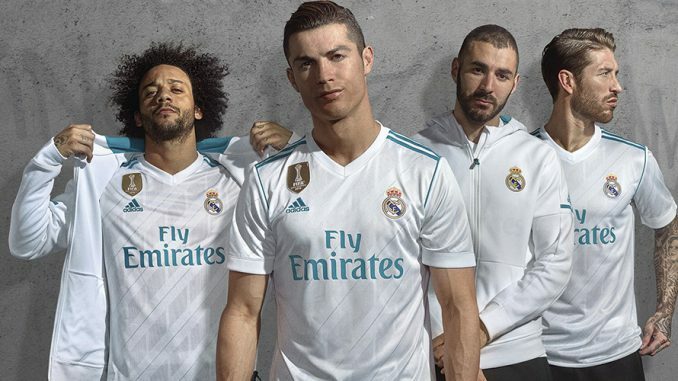 Consequently, the Real Madrid uniform for 2018 is snow white. The jersey has a more modern look than that of the last season with the most notable difference being the lack of the stand-up collar. This version of has a sports collar instead with a v-neck design. Augmenting it are three Adidas stripes running along the shoulders but stopping just short of the sleeves. The seams where the sleeves touch the jersey are also light blue, as are the number on the back, the sponsor lettering and the manufacturer’s logo on the right breast. The only dash of colour is provided by the Real Madrid crest, which shines with its original gold circle topped by a crown. The shirt is made of 100% polyester and has ventilated mesh panel inserts for more breathability. A closer inspection will reveal faint silver lines running diagonally in the front, as well as a memorial stamp at the bottom to celebrate the club’s 115th anniversary. It is lightweight and comfortable, engineered to keep the players cool and dry during games. It is accompanied by white shorts and socks which also bear the light blue embellishments to match the outfit. Real Madrid kit is made by Adidas and includes its proprietary apparel technologies. It is softer than before and has been engineered to keep the players as comfortable as possible while they are in motion. What’s more, it is made with two innovations that are local only to Addidas. The first is ADIZERO, which has been previously limited only to footwear but now can be found in clothes made by this manufacturer. Adizero kits are constructed to be lighter than other garments and this is achieved by removing weight from the fiber itself as well as by replacing heavy elements like embroideries and trims with lightweight variations that are often just heated on. The jerseys that the Real Madrid players wear on the pitch feature Adizero. Here is Adizero explained in detail. The second innovation is the CLIMACOOL technology, which pulls the sweat away from the body to the outside of the garment, where it can dry faster. It also makes the shirts more breathable by featuring light-weight mesh panels in strategic locations, which help with micro-ventilation and with keeping the person cool. Each official Real Mardid jersey has the words “ClimaCool” or “adizero” pressed onto its bottom left size. Look for those to ensure the shirt is official. Here is more info on the ClimaCool technology. The club vision of this version of Real Mardid kit was to bring fans closer together. The shirts are especially designed to look great both at a football stadium and in a crowd on a busy street, where the logo and the colours of the team would make recognizing another fan much easier. The sky blue embellishments further this ideology, as they represent the Madrid sky and the connection between the city and the club itself. This theme of connection seems to be Real’s focus inspiration of this season. In the summer of 2017, Real Madrid did away with the purple theme and returned to a colour which has not been seen since 2013. Their new away shirt is now black and features turquoise trim. In contrast to the home jersey, the three Adidas stripes appear under the arms and the sleeves have a trim on the hem, instead of the seam. The number, the manufacturer’s logo and the club crest are all teal, while the lettering of the sponsor is white. The result is a very modern looking shirt that can as easily fit on the street as it does in Santiago Bernabéu. It has a more of a streetwear feel to it in contrast to the first shirt which is more classic. It has consequently been well received by the supporters. Facing Zinédine Zidane’s men is a daunting task. From the assaults of Chistiano Ronaldo and Gareth Bale who can shatter any defense to the virtuosity of Toni Kroos and Luka Modric in the midfield and the rock solid wall of Marcelo and Sergio Ramos in front of Keylor Navas in net, the team has enough skill to destroy any opposition. Los Blancos have been exciting to watch for many years and this has generated the club many passionate fans all over the world. To celebrate that fact and to thank the supporters for their unwavering loyalty, Real participated in Adidas idea to have their third shirt designed by the fans. What followed was a world-wide contest in which supporters submitted their ideas. One was ultimately selected and it has become the team’s third shirt for the season. The third shirt is light blue and features a pixelated design. It sometimes appears teal – depending on the light – and it has a collar that is rounded, instead of v-shaped like the other two kits. It has become an instant success after the launch and has been well received by the fans. Most the trims are white, including the club’s crest, and the three Adidas stripes are black and appear once again on the shoulder. For more information on this iconic shirt please check our previous in-depth review that examines it in detail. 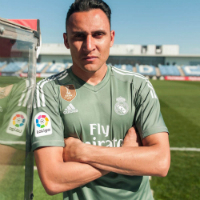 Keylor Navas’ kit is pale green for home games. It has a v-collar and white trims and lettering. The three Adidas stripes run onto the sleeves. “Trace Green” is the term used by Adidas for this particular colour and it is indeed quite unique. For away games, the Real Madrid keeper dons an orange version of the shirt. Adidas makes two versions of the Real Madrid jersey – authentic and replica. The differences are subtle, but they do exist. The authentic version of the kit is what the players wear on the pitch. The replica versions are the shirts made for the fans and they are more forgiving in style, as they fit all shapes and sizes. They are simply looser in design and look better on those whose bodies may not resemble 20-something year old athletes at the peak of their professional careers. Additionally, the Real Madrid logo is pressed on in the authentic version but embroidered on the replica one. This makes it stand out more on the fan jersey, which is precisely what club pride is about. Finally, remember those Adidas innovation technologies we talked about earlier? The authentic jerseys come with Adizero technology, while the replica ones have Climacool. If you are interested in an official Real Mardid jersey, check out the current and past jerseys at Subside Sports. For the third shirt – the blue one – please check our review. 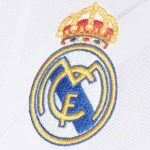 How do you rate Real Madrid uniform for 2018? And what about the team? Is there another Champions League trophy in the making? Let us know below! I love the shirt! I have a good friend (an international student) that stayed with me and he is now a pilot for Emirates. I was looking for some flight gear for him, because he says it is cheaper to get here in the U.S. I came across this post, and he loves the shirt. I like the white one. Looks crisp and modern. The pale green one is also a keeper for sure. Did Emirates sponsor the team? Is that why all their jerseys say Fly Emirates? Indeed. Emirates Airlines is one of the current sponsors of Real Madrid and that’s why their name appears on their jerseys. The one before was BWIN, which is an online casino. If you are interested in the Adizero version of the shirt, you can find one here. They are pricier than the fan versions, because fewer are made and they are made usually for the players themselves, but they are also thinner and more body-hugging. Those who “keep it tight” – as you said – will benefit from the trim, superhero look of the shirt while on the torso. For the majority of other football fans who come in different shapes and sizes (that slight beer-belly is a result of a lot of socializing and we are proud of it!) I recommend the fan replica versions. I like the new Real Madrid home jersey. It’s nice and elegant looking. The white and the blue works for me. I also like the new Real Madrid away jersey. I’m not sure yet if I like it better than the previous one, but I like this new one. The third kit is nice too. Despite the colour, I can make it work with my current clothes. I don’t play soccer / football but I do buy jerseys and usually match them with my current clothes. I always wondered about the difference between the authentic and replica was. For a long time, I thought the replica was not ‘official’ and almost a knock-off. Thanks for the clarity. Lastly, it’s good to know that the new jerseys have the new adidas technology. I’ll probably still go with the replica, but glad to know that it’s Climacool. I really like the look of both the home and the away kits. Both look really class. I do though prefer the away top best. That looks so cool. Thanks for pointing out the difference between the authentic and the replica versions. I didn’t even know there were different versions, but after you explained it does make sense. I wonder though whether the fans could get hold of the authentic ones? Indeed they can. The authentic adizero jerseys are also available (you can find them here). Like I said before, they will cost you a bit more, though. The new design of the shirt looks inspiring and unique. I would rather buy away top – it is more suitable for me with respect to colors. Thanks for the information given!